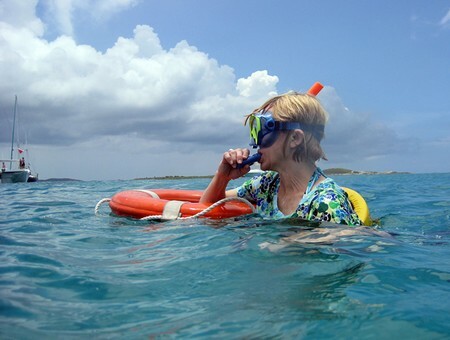 Snorkelling is something worth trying the next time you are near water that is suitable for swimming. It’s the sort of activity that most people discover when they are on holiday. To get your first glimpse of the underwater world, you will need to wear a face mask that allows you to see clearly below the surface. You will also need a snorkel tube that enables you to breathe without having to lift your head up. Both pieces of equipment are usually easy to find and cheap to buy in local shops. Most of us prefer to swim at the surface of the water. In doing so, most of our energy is consumed in trying to keep our heads unnaturally clear of the water so that we are able to breathe regularly. The snorkel tube frees us from that constraint. As a result, snorkellers discover that they can spend hours simply floating on the surface, relaxed and looking down at what is going on below them. Snorkelling is almost risk-free. You don’t even have to be a good swimmer if the sea is calm and there are no currents to worry about. It’s something that people of all ages can do, making it an ideal activity for the whole family to enjoy together. Once you are confident swimming on the surface, it’s time to take a breath, hold it and dive down for a closer look at the fascinating things underwater. Swimming beneath the surface requires no additional energy but you will need confidence in your ability to get back to the surface once you feel the need to breathe. A buildup of carbon dioxide triggers your brain to tell you to breathe. Before you can take in more air, you must exhale to get rid of the carbon dioxide, which is a waste gas. When you break the surface after a short swim underwater, simply tilt your head back and blow the water from your snorkel tube. You can then take another breath before diving below the surface once again. Hyperventilation is a deep breathing technique that can be performed before exercising to flush out the normal residual levels of carbon dioxide in the lungs. If the breath-holder starts with lower levels of this waste gas, the urge to breathe is deferred. However, the body will still use the same quantities of oxygen from the air in the inhaled breath retained in the lungs prior to immersion. If this life-giving oxygen is consumed before the urge to breathe is triggered, hypoxia can occur, resulting in unconsciousness and, if underwater, drowning. With this in mind, you should never hyperventilate before swimming underwater. Take a normal breath and enjoy a safe and wonderful experience for as long as it lasts. The extreme sport of free diving involves divers getting as deep as possible with only a lungful of air. Participants have to be extremely fit and use special techniques to achieve seemingly impossible depths. Divers Jacques Mayol and Enzo Maiorca first set records of around 100 m (330 feet) and inspired the film The Big Blue, but these have been broken many times since by divers Umberto Pelizzari and Pipin Ferreras. Female diver Tanya Streeter broke the men’s ‘no limits’ record in 2002 by diving to 160 m (525 feet). The unofficial men’s record in this category now exceeds 200 m (660 feet). Don’t try this at home!